500 gm. or 1 lb. any firm fish like salmon/haddock/cod/any other fish available locally, cut into 2 inch pieces or steaks. Wash and dry fish pieces. Mix garlic, turmeric and salt, cover the fish pieces in this mix and marinate for 1/2 hour or so. Heat oil in a wok or frying pan and fry all fish pieces in moderately hot oil, until fish is sealed and browned a little on all sides. Keep aside on an absorbent paper. In the remaining oil, add mustard seeds and fenugreek seeds. When the seeds splutter, add curry leaves and stir. Mustard seeds jump a lot; you may need to cover for a few seconds. Do not allow seeds to burn, burnt seeds are bitter. Add onions and fry until dark, golden brown. Add coriander powder, chilli powder, garam masala and chopped tomatoes. Fry for a few minutes, until oil separates. Mix Colman's mustard paste with 1 cup of water and add to the pan. Bring to boil and simmer briskly, for 2-3 minutes. Add Fish, bring to boil and simmer for another 5-6 minutes. Do not cover. 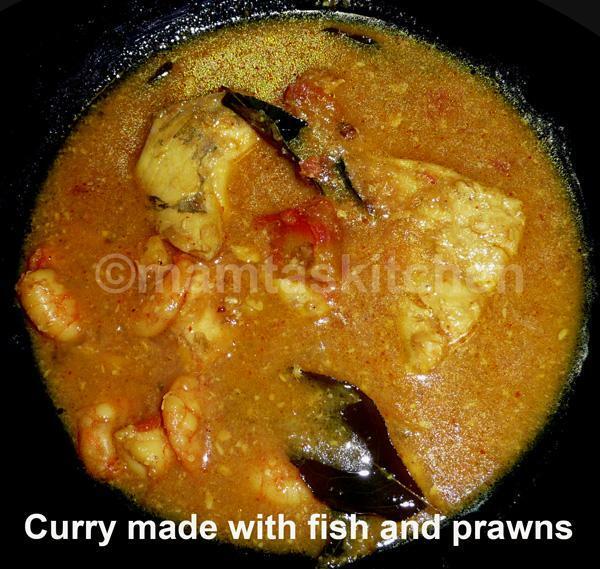 Garnish with coriander and dill leaves and serve hot with Boiled Rice and Chapatti. 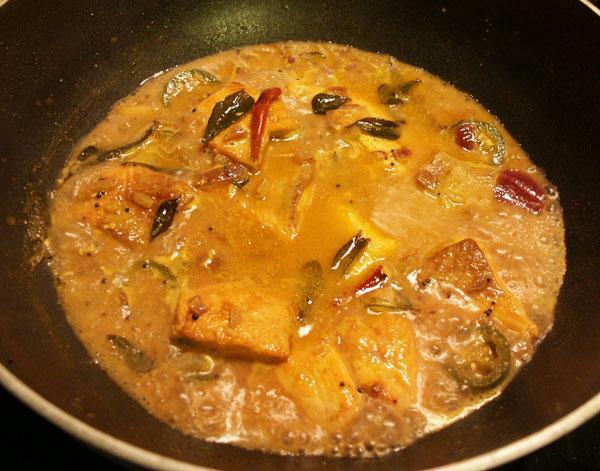 If you are short of fish or it is very expensive, you can add potatoes to this curry. Slice 1-2 large potatoes into thick discs. Marinate in turmeric, salt and garlic, along with the fish. Fry in the same oil as the fish, until nicely browned. Add to the gravy at the same time as the fish.